The unique "hinge and pin" system of this socket tee enables existing structures to be easily modified without the need for dismantling. Hinges around existing size 8, or 1-1/2" Schedule 40 pipe (1.90" O.D.) and allows for attachment of Handrail Bracket stub or of an Internal Coupling 514-7 with either the 565-7 or 567-7 Returns. Does NOT attach directly to pipe on stub end. The Kee Access ADA Railing System is a cost effective handrail installation suitable for stairs, ramps or walkways that conform to the railing requirements of the American with Disabilities Act (ADA). An ADA railing is a framework of horizontal rails supported by vertical uprights (posts), assembled from fittings and pipe. This type of railing provides a contiguous gripping surface throughout its entire length. The modular Kee Access Railing fittings securely join standard sizes of schedule 40 galvanized steel pipe and is flexible enough to accommodate most variations between design drawings and site requirements. The system does not require any drilling, welding or threading, and is easily assembled without specialized workers or equipment. All fittings are galvanized for low long-term maintenance and can be powder coated to your choice of RAL Colors. Does the fitting come with set screws? Yes, Kee Klamp, Kee Lite and Kee Access fitting comes with the required set screws. If you would like extra set screws they are available for purchase. Stainless set screws are also available for additional corrosion protection. Are these fitting available in colors? Yes. Kee Klamp, Kee Lite, Kee Access fittings and pipe can be powdercoated to give them a durable baked on paint finish. powder-coating is extremely durable and will give your railing or structure a really sharp look. There is a fee per fitting. Click here for powder-coating pricing. The cost goes down the more fittings you order. powder-coating adds about two weeks of lead time. Please contact us if you have any questions about powder-coating. What kind of pipe can be used with Kee Klamp and Kee Lite fittings? Kee Klamp and Kee Lite components are designed to be used with Schedule 40 Pipe (or Schedule 80), but can also be used with other types of pipe or tube. When acquiring your own pipe and tube it is important to know the actual OUTER DIAMETER of your pipe/tube . Do not assume that just because it says 1 Inch Pipe/Tube for instance, that the outer diameter is actually 1 inch. This mistake frequently results in returns. 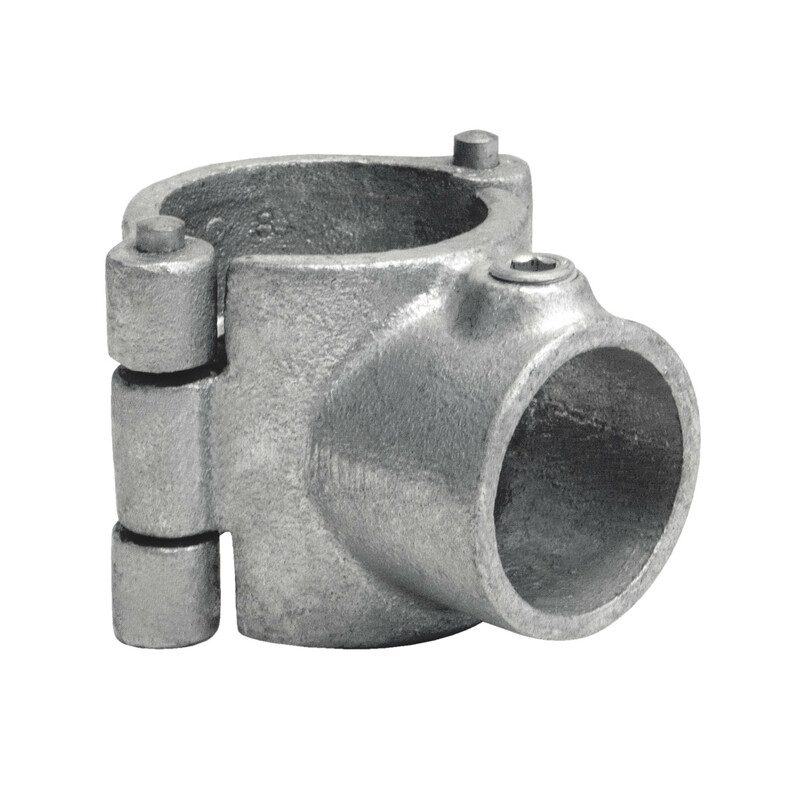 If you are purchasing fittings and pipe from our website, match the pipe size with the fitting size such as Size 7 pipe with Size 7 fittings, Size 8 pipe with Size 8 fittings, etc. You may also refer to our SIZING CHART for further help. How can I be sure I'm ordering the right size fittings? If you already have pipe, please measure the outer diameter of your pipe and compare it to the chart on this page. For simplicity we have a printable pipe chart that you can use to measure your pipe. Be sure to follow the instructions on the sheet to guarantee an accurate measurement. If you are purchasing your pipe from us, then be sure to match the size after the dash '-' on the fittings to the size of the pipe. For instance, a 10-7 is a size 7 fitting. Select size 7 pipe to go with that fitting. 7 / Outside Diameter 1.660", 8 / Outside Diameter 1.900"